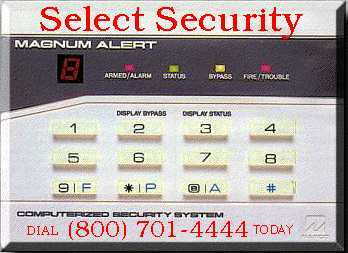 Select Security specializes in affordable products and services for all your home and business needs. Our professional installers will provide you with the equipment, installation and 24 hour monitoring. We have been protecting property in Southern California since 1987. Our Equipment is UL approved and guaranteed. We will visit your location and provide you with a "single-price" quote. Most alarms are installed within one day. Copyright ©2019 artsci inc. all right reserved.